You would have been as welcome as flowers in May to any of my MSS. of my books, but I never keep such things (except a few drafts of my outlines that happen to be in bound vols. with other things I cannot be spared). I have not a single leaf of any other draft. Those of my notes on Hamlet have been consigned to the waste-paper basket years & years ago. And I have a special objection to being photographed. My wife got me to have it done some time ago but only on condition of a very few copies being taken & those for members of the family. Hoping to have the pleasure of seeing you again on your next visit to the old country. J.O. 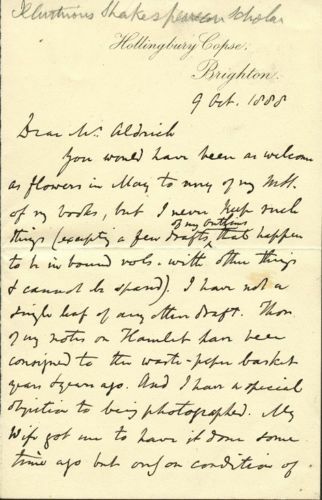 Halliwell-Phillipps (1820-1889), the illustrious Shakespearean scholar, wrote this letter to the "moderate" American autograph collector, Charles Aldrich (1828-1928) on Oct 9th, 1888. I have been in a moderate way an autograph collector, one of that queer species almost literally flayed alive by Thomas Carlyle, Ralph Waldo Emerson, and Horace Greeley, saying nothing of the objurgations of a somewhat lesser man here and there, like Julian Hawthorne, or the Prince of Wales. I tried, however, to give away my collection, and thus, "get shut" of this folly; but when in 1884, the Judges of the Supreme Court accepted it as a gift to the State of Iowa, good old Judge Beck put his hand on my shoulder and said: "Now, Aldrich, we want you to consider this only a beginning. Go ahead, and keep this Collection growing; and it will come to something one of these days... (406). Continue to build the Aldrich Autograph Collection, he did. The Collection included not only specimens of handwriting by Henry Wadsworth Longfellow, Walt Whitman, Abraham Lincoln and other notable Americans, but specimens of handwriting by notable Englishmen as well, including Robert Burns, Charles Darwin, and Austin Dobson; specimens which he obtained while visiting England three times. On at least one of his trips to England, Charles Aldrich met J. O. Halliwell-Phillipps. And although Halliwell-Phillipps wrote in his Oct 1888 letter that he hoped to see Aldrich again on his "next visit to the old country," they never met again; J. O. Halliwell-Phillipps passed away on January 2, 1889. 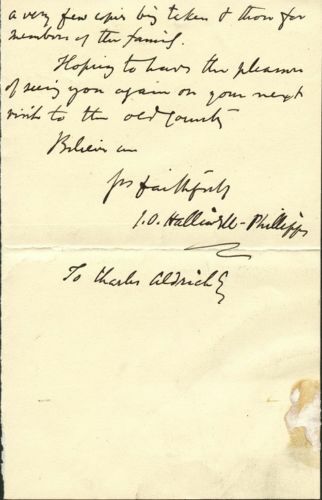 It is possible that Aldrich acquired an autograph letter from Halliwell-Phillipps on one of his trips to England. That would explain why the 9 Oct 1888 letter is not in the Aldrich Collection. 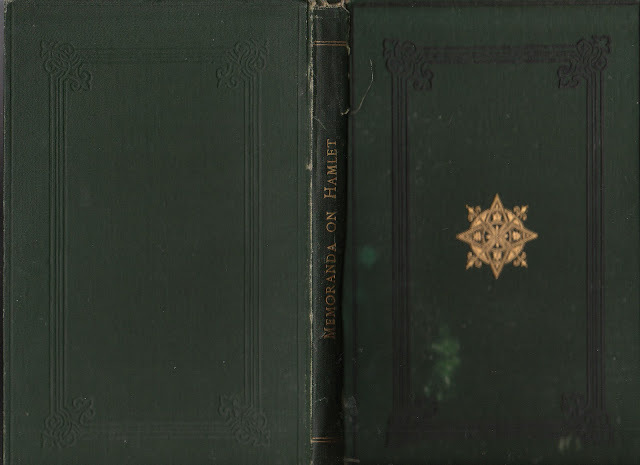 The "notes on Hamlet" that Aldrich hoped to obtain from Halliwell-Phillipps was probably the manuscript of Halliwell-Phillipps's book, Memoranda on the Tragedy of Hamlet, London, 1879. Incidentally, Halliwell-Phillipps presented James Russell Lowell with a copy of this book in 1881, while Lowell was the American Minister in England. And yes, Aldrich met Lowell in London in the 1880s. 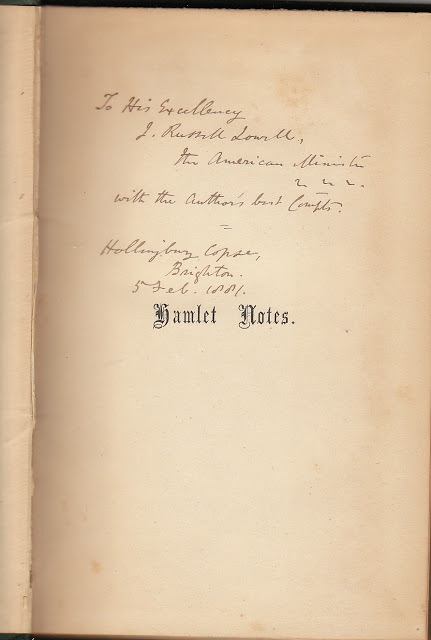 Lowell's very copy of Halliwell-Phillipps's book is now in my own library. I acquired it from Krown & Spellman, Booksellers of Culver City, Ca. in 2004. If you want to know more about J. O. Halliwell-Phillipps, I wrote all about him in my Nov 30, 2011 blog post, J. O. Halliwell-Phillipps, Bibliophile. And he appears briefly in several other blogposts of mine that pertain to Shakespeare, most recently in my Oct 28, 2013 blog post, A Splendid History of Ownership. Aldrich, Charles. "The Building of An Autograph Collection." The Annals of Iowa 9 (1909), 81-94.